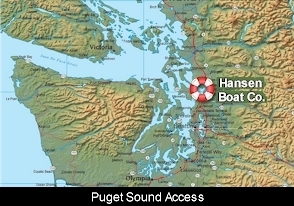 Hansen Boat Co has offered the area's only portable dry-dock since 1995, allowing a facility for repairs, wherever you are. The docking system is 140' long x 48' wide with a lift capacity of 866 tons. "Sigrid Dunlap" launched by Hansen Boat Co. on January 20, 2018. Visit the New Construction Page to view launch video. Welcome to Hansen Boat Co.
Hansen Boat Company is well known for quality steel boats that are up to the challenges of the Bering Sea - and beyond. Building for the commercial fishing industry since 1927, the Hansen name has been synonymous with tradition and quality for generations. Hansen Boat Company can respond quickly with a broad range of capabilities to insure that results are safe, sound, and economical. Whether your need is for new construction, or the most complicated ship repairs and maintenance procedures, Hansen has the facilities necessary to carry them out. We can insure you're back on course and back to work as quickly as possible. Please contact us with any question you may have about our capabilities and services. We look forward to an opportunity to serve you. (C) Copyright 2012 - Hansen Boat Company. All Rights Reserved.